Over the past two years, I have longed to establish Easter traditions for our family. This comes with each holiday as our family grows. We have begun a collection of books to tell the story and meaning of holidays. This year, I have begun keeping them on our coffee table - this helps us read the books more frequently and begin having conversations about the season of Lent. Here are the books we have so far. The Easter Story - Biblically accurate, this story of Jesus' death and resurrection is closest to what I want to be teaching Behr. What Is Easter? - Behr's favorite Easter book so far, he likes saying, "No," when we talk about whether or not Easter bunnies, eggs, and jelly beans as we flip through this board book. This is a great simple intro to separating the commercial view of Easter from why we celebrate God's son in the church. The Legend of the Easter Egg - A wonderfully redemptive story about a boy and his sister who is severely ill during Lent. This book is better for slightly older kids. I also recommend reading it first yourself to be prepared for some of the questions that this book might raise. 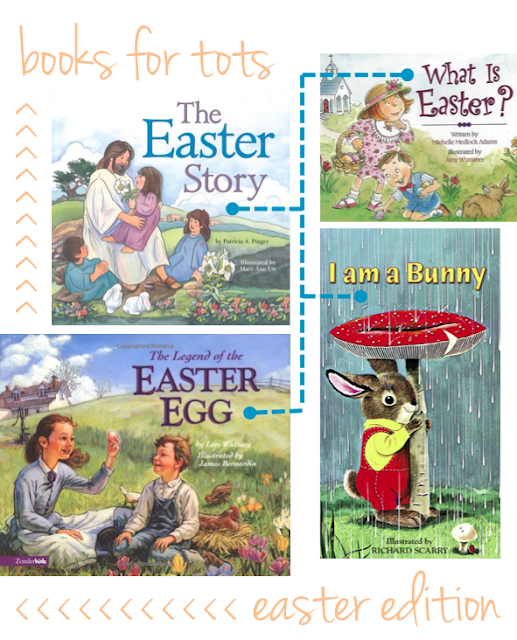 I Am a Bunny - this is not specifically an Easter book, it isn't even actually a Spring book. But the illustrations are wonderful and something about the change of seasons makes me pull this book out this time of year. Definitely a keeper! I would love to grow this collection, so please share your recommendations in the comments!